A perpetual plaque is a great way to show off numerous periodic award recipients, donors, or commemorated individuals. 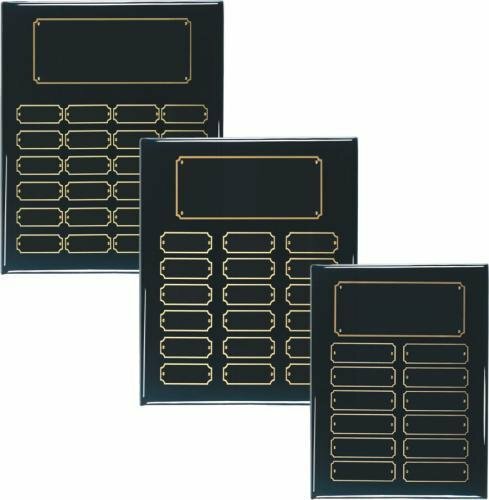 We have several large sizes and configurations to choose from, featuring an economical cherry finish plaque board and black individual and header plates (with gold lettering). Black header plate offset with gold edge. Price includes up to 30 words engraved on header plate, or 20 words plus graphic/logo, and 2 lines of lettering each on up to 3 individual plates engraved during assembly. Additional lines and/or individual plates engraved during assembly will be charged separately based on quote. Please see Artwork File Formats for acceptable formats for graphics. Place in cart to order online, specify text and attach graphics/logos, and select in-store pickup or other shipping method. A perpetual plaque is a great way to show off numerous periodic award recipients, donors, or commemorated individuals. Our 10.5" x 13" 12-plate cherry-finish photo plaques feature 3 different photo sizes to choose from (see below) black individual and header plates (with gold lettering). 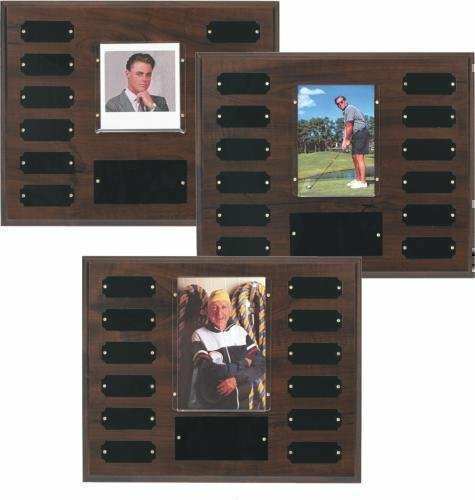 A perpetual plaque is a great way to show off numerous periodic award recipients, donors, or commemorated individuals. We have several sizes and configurations to choose from, featuring the quality of a genuine walnut wood plaque board and black individual and header plates (with gold lettering). Black header and individual plates are offset with gold edge. 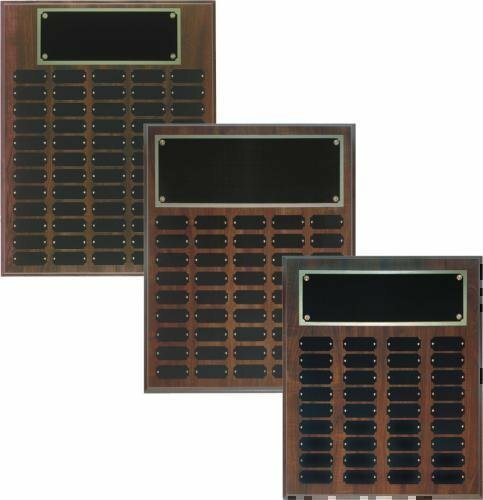 A perpetual plaque is a great way to show off numerous periodic award recipients, donors, or commemorated individuals. We have several sizes and configurations to choose from, featuring the quality of a high gloss black wood plaque board and black individual and header plates (with gold lettering). Black header plate offset with gold edge. 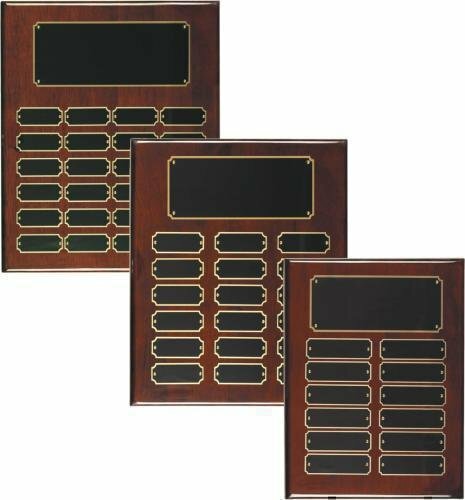 A perpetual plaque is a great way to show off numerous periodic award recipients, donors, or commemorated individuals. 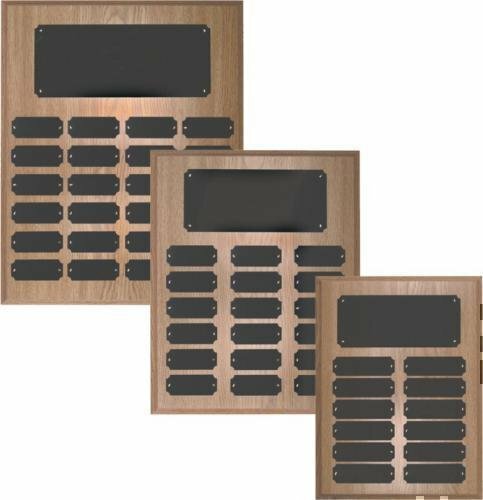 We have several sizes and configurations to choose from, featuring the quality of an oak-finished plaque board and black individual and header plates (with gold lettering). 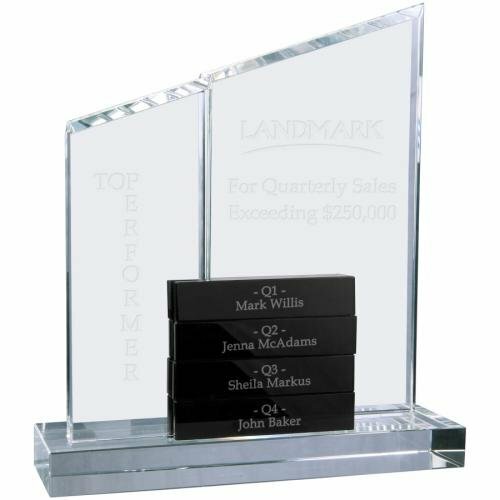 Our newest perpetual award offering, this unique crystal standup plaque with two distinct peaks measures 8" across by 9" tall and features individual black blocks (four included in base price, up to six able to fit) added at your discretion (for alternative configuration see JDCRY7022BU). Add your award information on the large peaked side and individualize accomplishments on the removable blue blocks. Additional blocks may be purchased separately. Personalize this stunning item to recognize and honor the top performers in your organization.This premier award is packaged in a velvet lined gift box. Place in cart to order online, specify text, and attach logos and/or images. Please review Artwork Requirements before submitting your logos and/or images. Our newest perpetual award offering, this unique crystal standup plaque with two distinct peaks measures 8" across by 9" tall and features individual blue blocks (four included in base price, up to six able to fit) added at your discretion (for alternative configuration see JDCRY7022BK). Add your award information on the large peaked side and individualize accomplishments on the removable blue blocks. Additional blocks may be purchased separately. 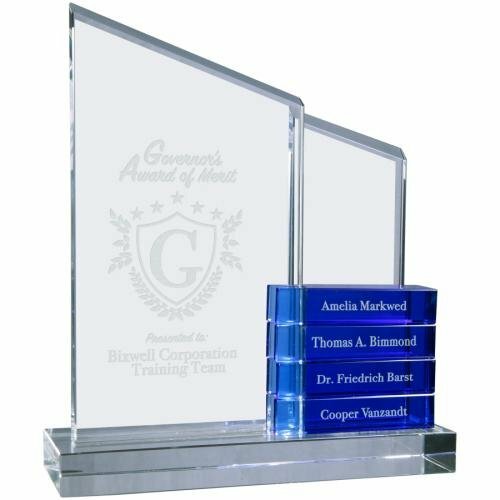 Personalize this stunning item to recognize and honor the top performers in your organization.This premier award is packaged in a velvet lined gift box. 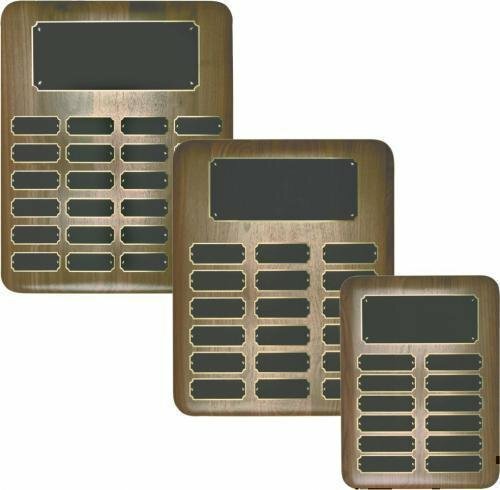 A perpetual plaque is a great way to show off numerous periodic award recipients, donors, or commemorated individuals. We have several sizes and configurations to choose from, featuring the quality of a high gloss rosewood finish wood plaque board and black individual and header plates (with gold lettering). Black header and individual plates are offset with gold edge.